DIABETES !! : what can we expect in future?? Light waves and ultrasound will replace needles in this new glucometer. 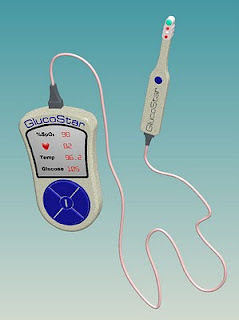 This glucometer indirectly measures the glucose levels of a patient's arterial blood as opposed to measuring it directly through a blood sample. This apparatus generates a combination of light waves and ultrasound from a probe that is placed under the tongue of person to measure vital signs on the patient. On the tip of the probe there are 2 sets of small light-emitting diodes (LEDs). The first LED emits light in the red spectrum of light and the second set of LEDs emits infrared (IR) light wavelengths. Also at the end of the probe there is an ultrasound transducer/detector used to capture the reflection signature of the sound waves that occur in the saliva medium of the mouth. The emitted red (R) and infrared (IR) lights from the probe bounce from the patients tongue and the reflected light signals are received by a photo detector. The R/IR ratio together with the sound waves is computed to reveal the amount of glucose in the patient’s blood. The amount light absorbed/reflected is different and it varies depending on what it encounters: tongue tissues, saliva, dead skin cells and most importantly by blood (both venous and arterial). The combined ultrasound waves can distinguish the signals that correspond to pulsating arterial blood and allow the photo detector to look at only these variable absorptions of light waveforms. 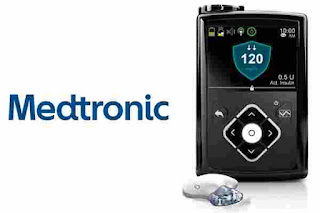 This new generation of glucometer using light and sound replaces needles in diabetic glucose monitoring and will permit a continuous signal feedback to control insulin pumps. it is still in experimental stage but if this dream comes true so many of our patients will have a better quality of life! !